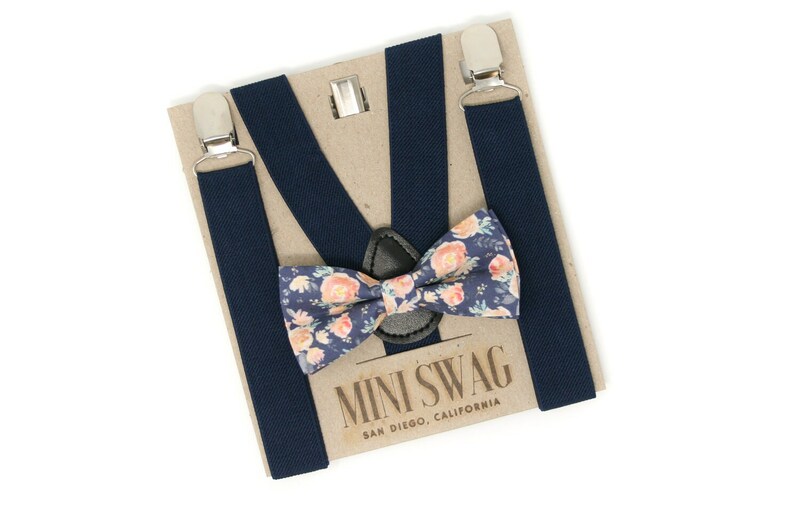 Your little one will be the talk of the party when he arrives sporting this beautiful peach floral bow tie & navy blue suspenders! Perfect for a ring bearer or page boy outfit, groomsmen, parties, cake smash or family photo shoot! The 100% cotton bow tie features flowers in shades of blue, peach, and coral. The kids bow ties come in 2 attachment options- on an alligator clip (best for squirmy little guys) or an adjustable elastic neckband (best for older kids). See images. Adult bow ties come on an adjustable fabric neckband. The fully adjustable navy blue suspenders come in multiple sizes and are made with extremely stretchable elastic for a comfortable fit. The silver clasps easily attach to most clothing.